Luciana has done comedy, drama, thriller and sci fi, now she can add horror to the list of genres in which she worked. 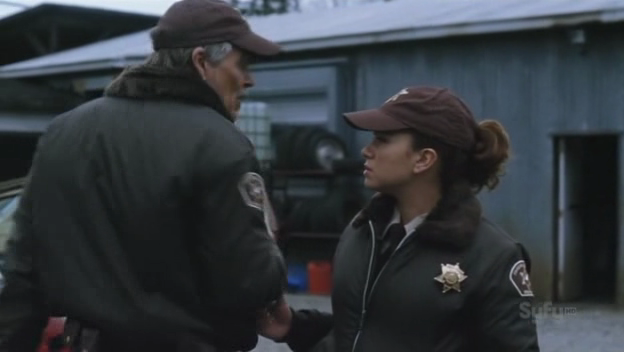 Luciana plays deputy sheriff Monroe in the movie of the week Phantom Racer, which aired on Syfy last Saturday. For those who haven’t heard of this film before, it’s about a race car which is possessed by the ghost of it’s former driver, who was killed in an accident. He blames his rival J.J. Sawyer (Greg Evigan) for his death and tries to take revenge using his car, killing everyone who gets in his way. Luciana looks great in uniform, no matter whether it’s in the Colonial fleet in Battlestar Galactica, in the US military in Murder at the Presidio or as a deputy in Phantom Racer. And now you can see for yourself even if you missed the movie, because Solium has made several screen caps of Luciana’s appearance, which you can see here on the fanboard. On an interesting side note, altogether three actors from Battlestar Galactica appeared in Phantom Racer as the three law enforcement officers. Winston Rekert, who played sheriff Hodges, was seen in BSG as a priest in two episodes, and Colin Lawrence (deputy Jackson) played Racetrack’s ECO Skulls in several episodes of the series. Luciana did her job of portraying a deputy sheriff well, and it was great to see her play a tough non-nonsense character once again. They didn’t give her much material, but she played the character in a believable way. The other actors also mostly did a good job, the script on the other hand was less than convincing. The premise of the movie is silly to begin with, but one still could have made an interesting movie out of it. Yet if they ever seriously attempted it, they failed, and instead settled for a horror flick with cheap shock effects (including Monroe’s gruesome death) . The car starts killing people pretty early in the movie, and not surprisingly J.J. Sawyer – who also meets his former girlfriend Tammy again and discovers he has a daughter, Jesse – becomes the main suspect. Luciana can be seen several times in the sheriff’s office and at the crime scenes. About halfway through the film, sheriff Hodges and deputy Monroe try to arrest J.J., but the phantom racer turns up and kills both Hodges and Monroe. So, needless to say, there is no Luciana in the second half of the movie. But that’s not the only reason why the movie becomes more boring from there. J.J., Tammy and Jesse spend the rest of the movie trying to escape or destroy the car, and they have some rather cheesy lines in between. Of course, there is no sense of threat there anymore, since one can assume that these characters will survive, and that all attempts to get rid of the phantom racer are futile until shortly before the end of the movie. Not surprisingly for such a film, the characters themselves don’t behave in a realistic way in most cases. Who would hang out with someone who is suspected of several murders, and say something like “Ah… right… with you killing my two dads and all” to him? While this can be excused as a pun on Greg Evigan’s series “My Two Dads”, there is no reason why the main characters should joke and goof around while trying to escape, only minutes after they witnessed the horrible deaths of Hodges and Monroe. It’s pretty clear from the beginning who’ll survive, so there is never a great threat of peril where the main characters are concerned. The plot is little more than an excuse to show a number of gory death scenes, so this movie will mostly appeal to fans of horror/slasher flicks. And as such a movie it does work, so fans of the genre might want to check this one out. If you watched this movie, feel free to share your thoughts on the fanboard, or in the comments section. This entry was posted in Uncategorized and tagged Film + Television, Phantom Racer, Pictures, Review, Screencaps. Bookmark the permalink. Looks like a modified Neon?